Sue's Rubber Stamping Adventures: LET THE PARTY BEGIN!!! Hi. Finally Friday! Cold here today. Supposed to last a few days too. Brrrrr.....come on Spring! Today's card is for the challenge at Mo's Digital Pencil 2. The challenge this week #75 is "Attitude". Well if this gal doesn't exude attitude I don't know who does. She's arrived, let the party begin!! I just bought this image the other day, love it. Do you love the hips and thighs? And her party hat too, what a woman!! I colored her with Copic markers. Used a lot of glitter in red and white. Papers are from my stash. Corner punch is from Paper Shapers. The frame is a Spellbinders die. The border punch is EK Success. Added heart rhinestones to the corners. Do you love this gal or what?? The party hat is a punch also! Wonderful, Sue. It could be ME! I don't know these stamps. The are so funny. Love them. She IS wonderful isn't she! I just posted my Veronica card and have the "Little Umbrella" ready to go too - we must be on the same wavelength - or maybe we both just appreciate the REAL women Mo drew - LOL. 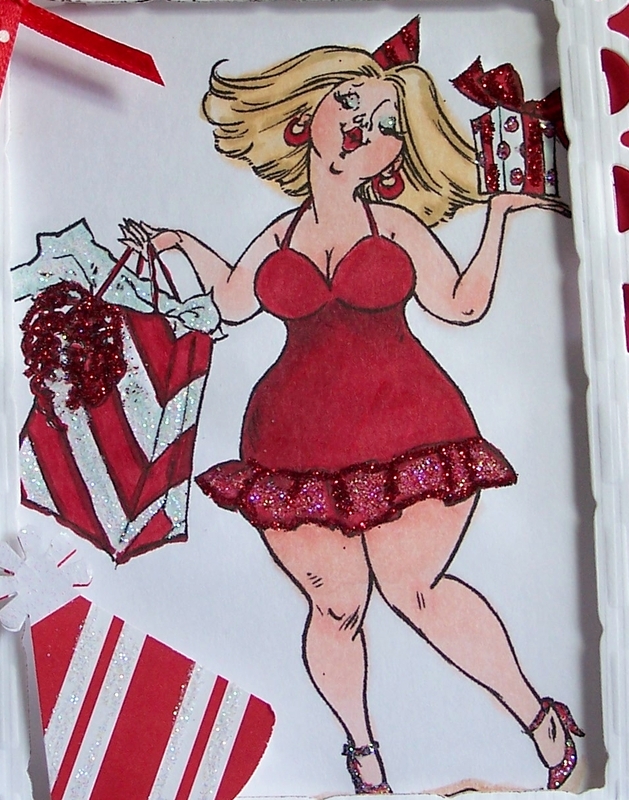 Your card is sooo full of fun - just like Veronica - LOVE it! Well bring on the Bling! This hottie is ready for a big party night. Lovin those lips!! Love your card. The red just adds to her attitude in a big way. I just love this image and will just have to put it at the tpo of my wish list! Thank you for sharing. Love this hot babe! The red and white is striking, and the touches of glitter are perfect. Glad you shared it with us in Mo's Challenge. Oh how cute! Love the red too!!! Wonderful card tee hee hee!!!! 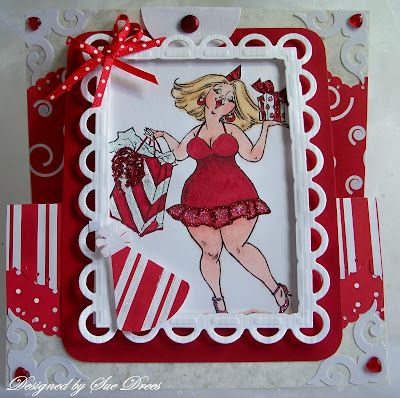 what a fun image, very beautiful card sue. so chic and gorgeous card. Love this card Sue, what a great image and love what you have done with her!